Overview: Do you love making fun of your friends? Mimic Circus app is the best way to make fun of them! All you need is a friend's picture and our app. Edit. Save. Share. Laugh. Simple? Yep. It's Mimic Circus. Welcome to a Circus where anyone can be a performer! Do you love making fun of your friends? Mimic Circus app is the best way to make fun of them! All you need is a friend's picture and our app. Using Mimic Circus, you can turn your hot girlfriend into a nerd, Santa Claus or into a character from popular Comics. You can also upload your picture and find out if you look nice with afro-hair, Angelina Jolie's lips or Charlie Chaplin's moustache. 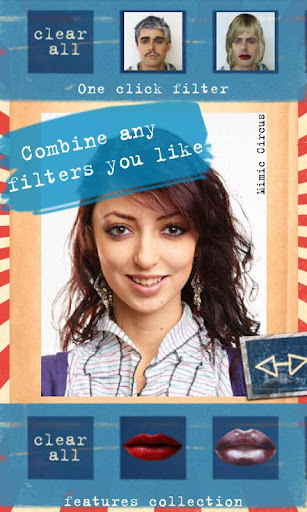 Dozens of filters to upgrade your photo and make it fun! ∙ Mimic Circus works best with front face photos. It's not just another photo application, but tons of fun and options to upgrade your photo in a great way!